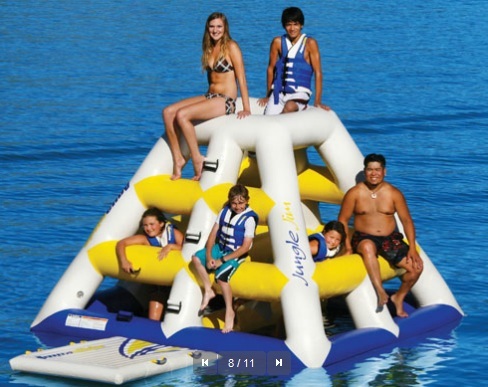 Whether you are looking to improve the waterfront activities at a camp, resort, country club, or at your own private lake house, our interactive and modular waterparks are just the right fit. They carry everything from slides, trampolines, jungle gyms, and many other multi-play inflatable toys, which will keep both kids and adults happy for endless hours at a time. Aquaglide has established itself as the world's highest quality inflatable water park manufacturer, releasing ground breaking and innovative new products each year. Most of their water parks are scalable, allowing customers to keep adding components every year. 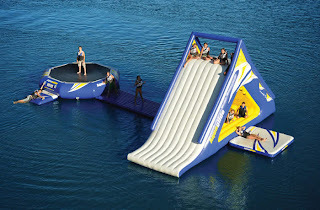 This modular feature gives the waterfront a new look each year, keeping it fresh, exciting, and loaded with wow factor.